Just finished the thirteenth novel in the No 1 Ladies Detective Agency series by Alexander McCall Smith. The novels are set in Botswana. 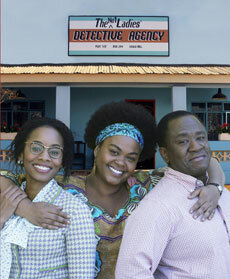 Precious Ramotswe is the main character. She is a traditionally built, happy lady who starts a detective agency and becomes busy, not just with her cases but with all the characters she shares the pages with: Her secretary Mma Makutsi with her 97% typing skills and her talking shoes, her husband Mr. J.L.B. Matekoni with his two shop assistants Fanwell and Charlie and the trouble they get into or cause, just to name a few. In The Limpopo Academy of Private Detection Mma Ramotswe meets Clovis Anderson, the author of her detective agency bible – The Principles of Private Detection. She has always used this book as her guide in her work. So when two of her favorite people in the world find themselves in terrible trouble, Mr. Clovis Anderson’s sudden appearance seems like a God-send. But Mr. Clovis Anderson is not all that he seems to be. Or is he? In this book we get to see Mr. Anderson’s POV, which leads me to believe he may be a returning character even though at the end of the book he is about to leave Africa for his home in America. The book’s title (the academy of private detection) is hardly a subject within the story, but by the end of the book the reader will have to admit that the title is a mystery fit for any private detective. If the reader follows Mr. Clovis Anderson’s advice to use COMMON SENSE then the reader will just have to be patient and wait for the next book to come out to discover the answer. Good job Mr. Alexander McCall Smith. The book series is not hard-boiled, quite the opposite. These books will leave you feeling happy. For those hoping for another recommendation for a series. Here it is. So happy to see another fan of this series! I have loved it for years and pressed it upon my friends – to their delight!